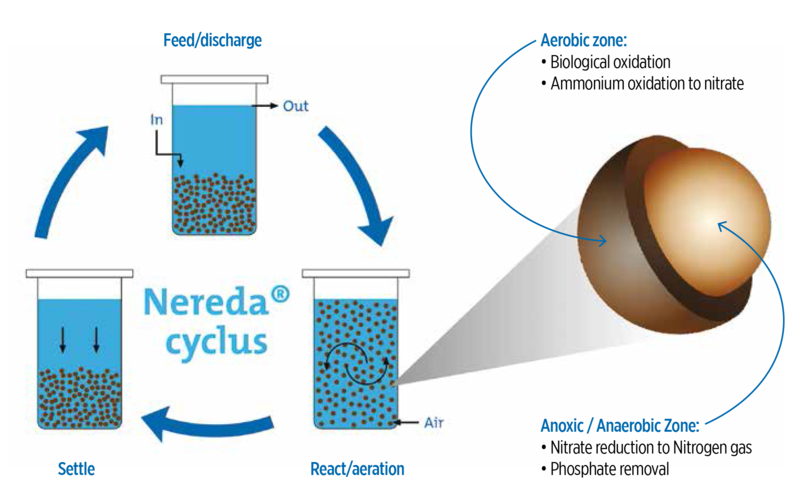 Could you summarise how the Nereda treatment differs from conventional bacterial treatment for wastewater and the advantages that brings to operators? Essentially, there is nothing different in the biology and it is only the way the organisms are structured but in terms of controlling the sludge volume index, people have managed to get a sludge volume index from 200-300 down to 100 but we managed to get it down to 40 (mL/g). [Granular sludge settles much faster: see box]. A new process reactor system is created to take advantage of this quick settling sludge and is integrated into the aeration tank instead of having a separate unit outside. And you can also work with a batch-type of process and the batch process is always inherently more efficient than a continuous process in converted capacity. The other thing, which is important, is the simplicity. The problem is that to really understand the biology and to understand what is going on inside the plant needs academic training because it is more complex to understand what is going on but from an operator point of view it is less complex. There is much less mechanical equipment and it is much easier to operate. Instead of recycling pumps and switch shovellers and mixers, it is mechanically much easier. It is also more feasible to implement in lower-income countries because the amount of equipment to import is less and also the training of staff can be much easier. What advantages does the technology bring in terms of environmental and bottom-line savings? How much energy a fuel pump uses depends a little bit on geology but Nereda takes about 40 percent less energy per population equivalent than a main treatment plant and there are 20 to 30 percent less greenhouse gases emitted because of the burning of fossil fuels. So energy consumption is lower. For N2O emissions there is not enough data yet to compare but if you use primary sludge for energy generation then you also end up with a system that is more or less energy neutral. The general investment costs are somewhere in the order of 20 to 30 percent lower excluding the price of land. Energy costs are lower, there is less investment in mechanical equipment and the labour costs may be lower because it can be operated with fewer trained people. You have mentioned the advantage of the system in terms of low equipment costs, staff training and energy savings but the take up in countries in Asia, such as Vietnam and Cambodia, where wastewater treatment is very low, has been sparse. How would you explain that? There was a ten-year investment in development and the developer needs to get its return on investment. When it comes to China there are concerns over property rights and it may not be interesting to develop there. In countries where you have a more privatised water system, then the system is taken up much rapidly than in a public environment. This is partly to do with risk as there is always a risk with new technology even if it has been proven at other sites and if you are a privatised company like Odebrecht in Brazil, they have concessions to treat wastewater, they have to build plants, and they may see an immediate return in terms of cost saving and benefits. A municipal authority does not get any real benefit for costs saving and gets a big penalty if something goes wrong. I am not in favour of privatising everything because in the end it makes everything much more expensive. But the balance between taking risks and getting blame if something goes wrong and getting no advantage if something goes well, then that means the public market will necessarily go slower and decision times in the public market are slow. The most crucial aspect for Nereda is that we started developing it and then went to the water boards and involved them in the development but told them I think in 2004 or 2005 you can only join if, by 2010, you build a new treatment plant and become a serious part of the planning and development scheme. So parallel to the project development, the process was in place that it could be immediately implemented. There is another impediment that you have which is that you need to go through plant testing and a validation process and there will be a governmental design office that first has to approve that the technology is good technology and that process of approval takes time. And a company has a choice: do I go to Brazil where I can sell, or do I go to Cambodia or Vietnam, where I first have to convince the local authority that this is a good technology and it make take years to get the approval? How do you get to market quicker in such a conservative industry? Your investment time is 20 years so it takes time unless you can come up with something, which is cheaper. For me, I can foresee with Nereda that it can go quickly to market in somewhere like Brazil because it has a big investment programme in new technology. But in the UK for example, where they haven’t don’t anything for 30 years and they really need to start doing something, people are only interested in change if you come up with something that is cheaper. Replacing an existing facility with Nereda probably makes no sense. We only approach large urban areas where you can free up space and you can redevelop that space which economically can be very interesting. Can awards help in terms of spreading the technology? It is a good recognition for the technology development both for customers but also importantly for decision makers. If I get the Lee Kuan Yew Water prize, then that shows the university research has some real value and inside the company for their wastewater group, if they get a prize, then it means the development team get better recognition from higher management. Sometimes I am up front for these prizes but there are many people in the background who are part of this and then they get recognition. What motivated you to move into biotechnological research particularly for wastewater? My main interest is simply curiosity: my main drive is to understand biology. I like things to be applied in practice but it is not my first driver. Academics who claim their main driver is to apply things are in the wrong job. Sometimes an academic when they have an idea will look to try and develop that within their academic group but they should realise it is not the task of the university to run pilot plants. It is only the task of the university to stimulate ideas and train people on an academic level. If one idea does not work then go to the next idea. If one idea is so good then quit the university with that idea and start your own business. But I think sometimes that can go wrong because the person who invented it feels so strong that they cannot sell it to anyone or let it go. From my own perspective, you explore, you don’t try to make something. Only 1 percent of microbiology has been inventorised so there is 99 percent to go. You keep in mind what the problems are and you link your explorations with some problem of society. 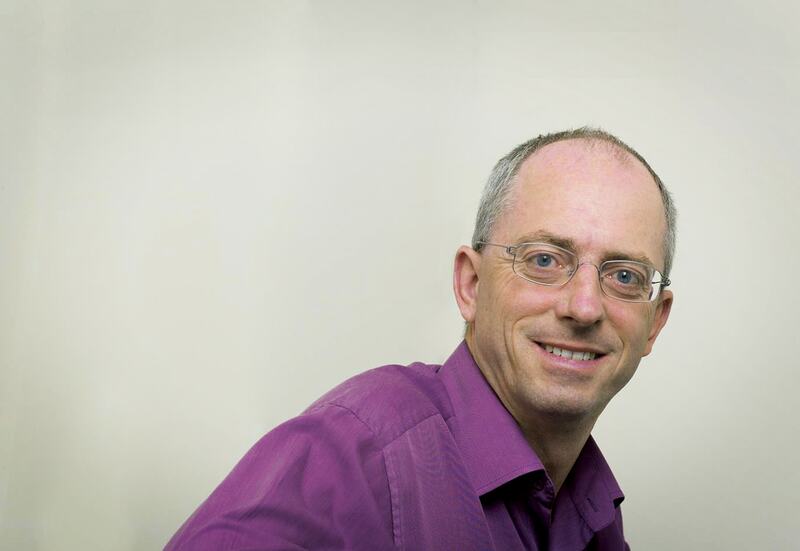 The technology for Nereda was developed at the Delft University of Technology in the Netherlands by Professor Mark van Loosdrecht and his team through a public-private partnership with the Dutch Foundation for Applied Water Research (STOWA), six Dutch water boards and Royal HaskoningDHV, the company exploiting the technology globally. With Nereda, the bacteria used to treat the wastewater produce compact granules rather than flocs (flocculent sludge), which then settle much quicker in the wastewater. There is no need for pumps to drive in bacteria for each different process as with Nereda, the different bacteria do their job of removing pollutants at the same time. This means the process is faster, less energy intensive and much more compact in terms of the size of the plant. The system uses a PC-based controller to control reactors and optimise the batch process depending on water flow and temperature. There are 30 plants in operation or under construction, the majority for municipal wastewater treatment and four for industrial treatment. Ireland was the latest country to announce an operational plant at Clonakilty with the first plant built at Epe in the Netherlands in 2011. Eighteen of the projects are in Europe with Australia (2), South Africa (2) and Brazil (6) all early adopters. We have just had SDG 6 approved by the UN General Assembly. How much are water professionals able to the influence the intergovernmental agenda to make water a priority? I think the issue is high enough up on the agenda, it is more how you organise it. If someone can locally earn a living out of sanitation then projects like the Gates Foundation can try and make it work but if you have to do it through governments then you need huge investments and you will almost by definition have corruption and there is always money disappearing. Second, I know quite a few NGOs who say water is a human right and should not be taxed. I agree water itself should not be taxed but the service to deliver your water and take it away, that can be taxed. If you bring it for free then no one is taking ownership or responsibility. Supplying water is a basic human right but supplying water at your tap is not a basic human right. If you want it to be brought to you directly there is a price associated with it, which you must be prepared to pay. It is easy for politicians to say water is a basic human right and people should have it for free. But if you make it for free, you don’t bring in money for investment, for maintenance, and for me that is a political thinking but people don’t get water service on to the agenda. For the big companies it is not in their business model to do it. We need to think how can we make sanitation systems that the local shopkeeper can operate. You cannot relay on the big companies like Veolia or Suez to change that. They can preach it but they will not do it. You need different companies and different mentalities. Partly NGOs, partly people like the Gates Foundation, who have the right line of thinking. As with microcredits, big banks cannot do that. You need different structures and lines of thinking and integration into the local economy to make them successful. What do you think are the key messages that water professionals should be taking to policymakers at COP21? Climate change has much to do with water resource availability but as we saw with the big problems in California, there are so many people there that the water shortage is not only a question of climate change but also population increase. If you focus only on climate change, you neglect the major issues of population increase and urbanisation, with everybody grouping together in a small area, and these are as important or maybe more important in terms of water resource availability than climate change. But population change is something which politicians won’t dare talk about. If you look at the onechild policy issues in China, a lot of politicians do not want to burn their fingers because it is a prime human right to reproduce. I am not advocating a one-child policy but if you really think about what the problem is, it is population growth. With climate change, we might adapt but with the population increase, we cannot adapt because of the increased demand.